Serving Rockledge, Viera, Melbourne, Merritt Island, and surrounding cities! Missing teeth can affect the way we feel about ourselves both personally and professionally. Do you find yourself hiding your smile because of missing teeth or unsightly dentures and bridges? Are your dentures unsecure and causing you difficulty chewing and speaking, while falling out at all the wrong moments? If you are missing one or more teeth and are ready to start smiling, speaking, and eating again with the comfort and confidence you deserve, then Dr. Jason Wetmore and Ocean Breeze Dental have the perfect solution for you. Today’s Dental Implants are often the best treatment option available for patients with missing teeth and in many cases look and function just like the teeth they replace. For many individuals dental implants are the ideal solution to replace missing teeth, lost due to periodontal disease, an injury, or tooth decay. 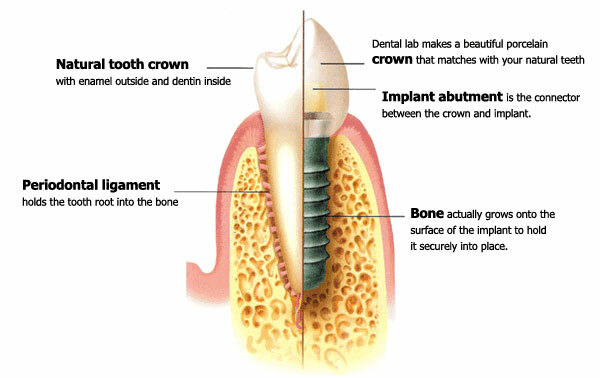 Dental implants offer a long-term tooth replacement option. They are fabricated out of specially treated titanium and over a period of several months they actually bond with the jawbone in a process termed "osseointegration". Dental implants look and feel so natural that patients often forget they have a false tooth. Decay is not a problem as with fixed bridges, and as long as adequate home care is taken to maintain the health of the gums and remove plaque, dental implants will actually help to maintain bone. Many of the early dental implants placed approximately 20 years ago are still in use today, and if properly cared for today’s advanced implant fixtures have the ability to last a lifetime. Removable Dentures may move around or cause annoying sounds while eating or speaking. Dentures will also lead to further bone loss in the area of the missing teeth, unlike healthy natural teeth and Dental Implants, which both stimulate and maintain the bone. Ocean Breeze Dental and Dr. Jason are proud to offer our patients a high-tech, more natural feeling and looking option for replacing their missing teeth.